Here is a blog post from Vitalik Buterin, the founder of Ethereum, on Ethereum pre-history. Here is another blog post with more history. If we had access to a trustworthy centralized service, this system would be trivial to implement; it could simply be coded exactly as described, using a centralized server's hard drive to keep track of the state. However, with Bitcoin we are trying to build a decentralized currency system, so we will need to combine the state transition system with a consensus system in order to ensure that everyone agrees on the order of transactions. Bitcoin's decentralized consensus process requires nodes in the network to continuously attempt to produce packages of transactions called "blocks". The network is intended to produce roughly one block every ten minutes, with each block containing a timestamp, a nonce, a reference to (ie. hash of) the previous block and a list of all of the transactions that have taken place since the previous block. Over time, this creates a persistent, ever-growing, "blockchain" that constantly updates to represent the latest state of the Bitcoin ledger. Once step (1) has taken place, after a few minutes some miner will include the transaction in a block, say block number 270. After about one hour, five more blocks will have been added to the chain after that block, with each of those blocks indirectly pointing to the transaction and thus "confirming" it. At this point, the merchant will accept the payment as finalized and deliver the product; since we are assuming this is a digital good, delivery is instant. Now, the attacker creates another transaction sending the 100 BTC to himself. If the attacker simply releases it into the wild, the transaction will not be processed; miners will attempt to run APPLY(S,TX) and notice that TX consumes a UTXO which is no longer in the state. So instead, the attacker creates a "fork" of the blockchain, starting by mining another version of block 270 pointing to the same block 269 as a parent but with the new transaction in place of the old one. Because the block data is different, this requires redoing the proof of work. 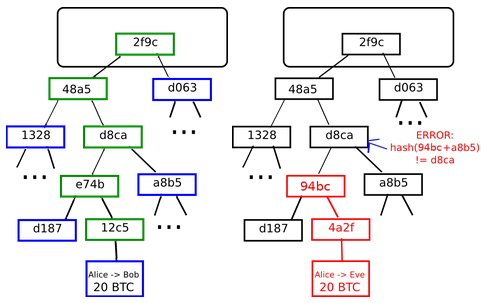 Furthermore, the attacker's new version of block 270 has a different hash, so the original blocks 271 to 275 do not "point" to it; thus, the original chain and the attacker's new chain are completely separate. The rule is that in a fork the longest blockchain is taken to be the truth, and so legitimate miners will work on the 275 chain while the attacker alone is working on the 270 chain. 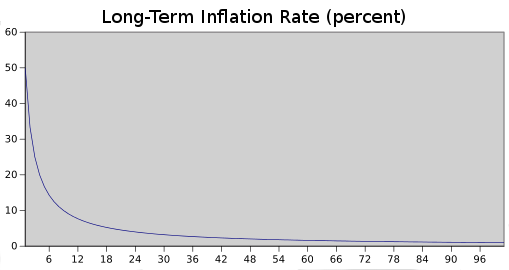 In order for the attacker to make his blockchain the longest, he would need to have more computational power than the rest of the network combined in order to catch up (hence, "51% attack"). Lack of state - a UTXO can either be spent or unspent; there is no opportunity for multi-stage contracts or scripts which keep any other internal state beyond that. This makes it hard to make multi-stage options contracts, decentralized exchange offers or two-stage cryptographic commitment protocols (necessary for secure computational bounties). It also means that UTXO can only be used to build simple, one-off contracts and not more complex "stateful" contracts such as decentralized organizations, and makes meta-protocols difficult to implement. Binary state combined with value-blindness also mean that another important application, withdrawal limits, is impossible. The formal execution model of EVM code is surprisingly simple. 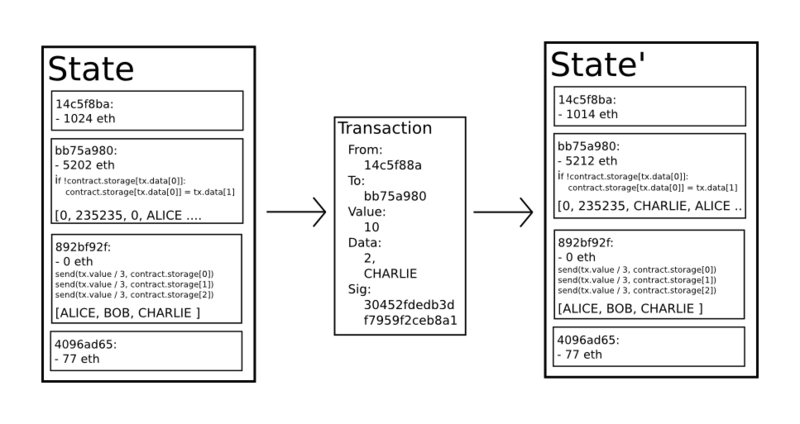 While the Ethereum virtual machine is running, its full computational state can be defined by the tuple (block_state, transaction, message, code, memory, stack, pc, gas), where block_state is the global state containing all accounts and includes balances and storage. At the start of every round of execution, the current instruction is found by taking the pc-th byte of code (or 0 if pc >= len(code)), and each instruction has its own definition in terms of how it affects the tuple. For example, ADD pops two items off the stack and pushes their sum, reduces gas by 1 and increments pc by 1, and SSTORE pops the top two items off the stack and inserts the second item into the contract's storage at the index specified by the first item. Although there are many ways to optimize Ethereum virtual machine execution via just-in-time compilation, a basic implementation of Ethereum can be done in a few hundred lines of code. Let TX be the block's transaction list, with n transactions. For all i in 0...n-1, set S[i+1] = APPLY(S[i],TX[i]). If any application returns an error, or if the total gas consumed in the block up until this point exceeds the GASLIMIT, return an error. On-blockchain token systems have many applications ranging from sub-currencies representing assets such as USD or gold to company stocks, individual tokens representing smart property, secure unforgeable coupons, and even token systems with no ties to conventional value at all, used as point systems for incentivization. Token systems are surprisingly easy to implement in Ethereum. The key point to understand is that a currency, or token system, fundamentally is a database with one operation: subtract X units from A and give X units to B, with the provision that (1) A had at least X units before the transaction and (2) the transaction is approved by A. All that it takes to implement a token system is to implement this logic into a contract. The contract is very simple; all it is a database inside the Ethereum network that can be added to, but not modified or removed from. Anyone can register a name with some value, and that registration then sticks forever. A more sophisticated name registration contract will also have a "function clause" allowing other contracts to query it, as well as a mechanism for the "owner" (ie. the first registerer) of a name to change the data or transfer ownership. One can even add reputation and web-of-trust functionality on top. There do exist non-mining full nodes. In the near term, Ethereum will use two additional strategies to cope with this problem. First, because of the blockchain-based mining algorithms, at least every miner will be forced to be a full node, creating a lower bound on the number of full nodes. Second and more importantly, however, we will include an intermediate state tree root in the blockchain after processing each transaction. Even if block validation is centralized, as long as one honest verifying node exists, the centralization problem can be circumvented via a verification protocol. If a miner publishes an invalid block, that block must either be badly formatted, or the state S[n] is incorrect. Since S is known to be correct, there must be some first state S[i] that is incorrect where S[i-1] is correct. The verifying node would provide the index i, along with a "proof of invalidity" consisting of the subset of Patricia tree nodes needing to process APPLY(S[i-1],TX[i]) -> S[i]. Nodes would be able to use those Patricia nodes to run that part of the computation, and see that the S[i] generated does not match the S[i] provided.